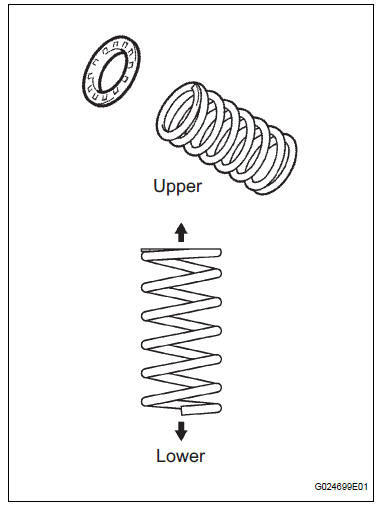 (a) Install the insulator upper LH to the coil spring rear LH. (a) Apply a shop rug to the rear axle beam assembly. (b) Install the coil spring rear LH to the rear axle beam assembly. 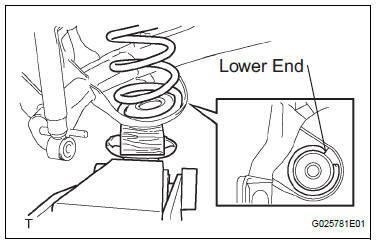 HINT: Fit the lower end of the coil spring into the gap of the spring lower seat. (c) Apply a shop rug to the rear axle beam assembly. (a) While raising the jack, connect the shock absorber assembly rear LH to the rear axle beam assembly. (b) Temporarily tighten the nut. HINT: Connect the RH side by the same procedures as the LH side. (a) Install the flexible hose and clip. 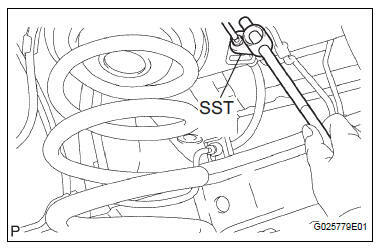 (b) Using SST, connect the brake tube to the flexible hose. (a) Install the 2 bolts and parking brake cable assembly No.3 to the rear axle beam assembly. HINT: Install the RH side by same procedures as the LH side. (a) Install the rear drive shaft assembly LH, 4 washers and 4 nuts. (a) Install the speed sensor rear LH and bolt. 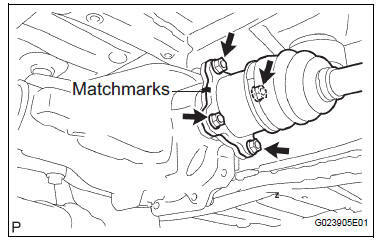 (a) Connect the skid control sensor connector. (b) Install the bolt and bracket to the rear axle beam assembly. HINT: Connect the RH side by same procedures with the LH side. (a) Install the rear wheel and jack down the vehicle. Torque: 103 N*m (1,050 kgf*cm, 76 ft.*lbf) (b) Bounce the vehicle up and down several times to stabilize the suspension. If it is impossible to tighten the nut at this position, support the rear axle beam assembly with a jack and load the rear compartment with a mass of approximately 90 kg (198 lb). HINT: Fully tighten the RH side by same procedures as the LH side. (a) Stabilize the rear axle beam assembly. (b) Fully tighten the bolt. Tighten the bolt and not the nut. The vehicle height should be the same as the height that the shock absorber is fully tightened. (a) Install the floor No.2 crossmember brace and 2 bolts. HINT: Install the RH side by the same procedures as the LH side. (a) Install the fuel tank filler pipe protector, 2 bolts, 3 screws and 3 nuts. (b) Install the fuel tank filler hose cover and 3 bolts.